Irene Dunne and Cary Grant were a match made in movie heaven. Thanks to their peerless talent – and the brilliance of director Leo McCarey – The Awful Truth stands as one of Hollywood’s funniest and smartest screwball comedies. Divorce was never so much fun. Mention screwball comedy to any classics aficionado and Carole Lombard immediately springs to mind. Without a doubt, she’s the genre’s queen, but leading the gaggle of ladies-in-waiting in her royal court was the highly underrated Irene Dunne, who often comes close to usurping Lombard’s title. Over the course of her 20-year film career, Dunne excelled in drama and possessed a lovely singing voice. (She starred in the original Show Boat and received top billing over Fred Astaire and Ginger Rogers in Roberta.) However, her unexpected gift for comedy captivated moviegoers and made her one of the most versatile and popular performers of her day. That day, however, has long since passed. Sadly, Dunne’s star has lost much of its luster. Despite five Best Actress Oscar nominations between 1931 and 1948, she rarely gets her due today. 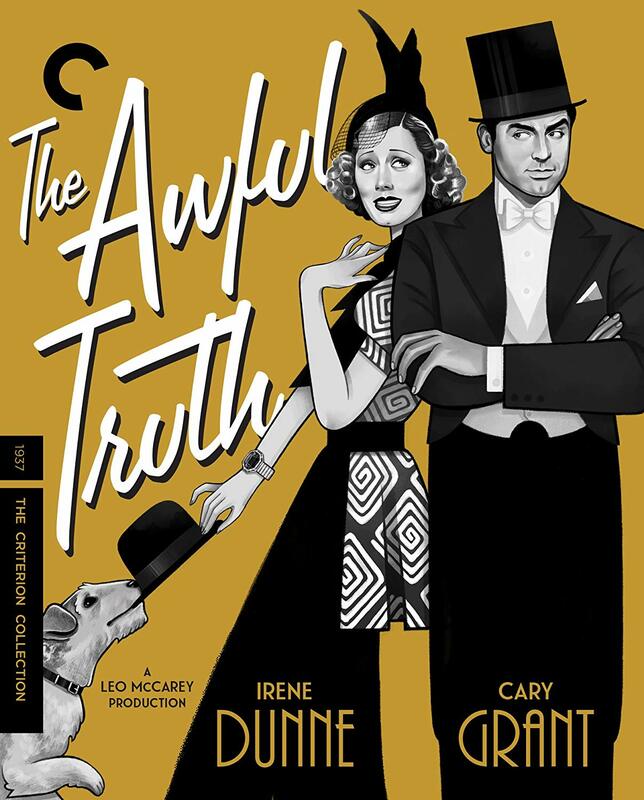 Hopefully, Criterion’s release of The Awful Truth, one of the greatest screwball comedies of all time and arguably Dunne’s finest film, will change all that. Though co-star Cary Grant in a career defining role deserves at least half the credit for the film’s success, without Dunne it’s doubtful this riotous divorce romp would enjoy such a rarefied reputation. Grant may steal the spotlight on numerous occasions, but Dunne consistently sparkles and is the oh-so-crazy glue that holds the movie together. Amid mix-ups, masquerades, and high society shenanigans galore, she shines, fashioning a strong and independent yet delightfully droll character while displaying deft comic timing and exuding more effervescence than a case of champagne. So what’s left for the warring Warriners? Why, divorce, of course! Jerry and Lucy impulsively split and a judge rules their divorce will become final in 90 days if it remains uncontested. It’s all too obvious the two are still in love, but instead of admitting it, they each try to bust up the other’s rebound romance… with hilarious results. Hilarity, of course, defines and fuels The Awful Truth. Though it lost the Best Picture Oscar to the stuffy Paul Muni bio-pic The Life of Emile Zola, Leo McCarey nevertheless nabbed the Best Director prize for his breezy, bubbly interpretation of Viña Delmar’s Oscar-nominated script. McCarey, perhaps best known for directing the iconic romantic weepie An Affair to Remember, reportedly drove his actors to distraction by dreaming up situations on the fly and encouraging improvisation. Yet that unconventional approach ups the comic ante considerably, infusing the movie with spontaneity, authenticity, and an infectious feeling of joie de vivre. I’ve seen The Awful Truth many times, and it always makes me feel laugh out loud, a lot. The humor never gets stale because Delmar’s zippy, smart screenplay makes some timeless (and very relatable) observations about marriage and seamlessly weaves them into the film’s zany fabric. The supporting cast excels as well. Ralph Bellamy scored an Oscar nod for his aw-shucks turn as a hick Oklahoma oil baron and mama’s boy who falls for Lucy. Cecil Cunningham grabs several big laughs as Lucy’s acid-tongued Aunt Patsy. Joyce Compton is also a delight as a ditzy Southern nightclub singer whose pitchy rendition of a ditty called “My Dreams Are Gone with the Wind” is enlivened by wild skirt-raising air effects that make Marilyn Monroe’s encounter with a subway grating in The Seven Year Itch look tame. And let’s not forget Asta, the energetic, scene-stealing dog best known for his appearances in The Thin Man movies with William Powell and Myrna Loy, who makes quite a lively impression here as Mr. Smith, the adorable pup caught in a custody battle between his two beloved masters. Screwball comedies are often too silly for their own good, but The Awful Truth succeeds where others fail by lacing its slapstick with sophistication, intelligence, and keen perception. That’s why this raucous farce still feels fresh 80 years later. Few films of the period are as funny. Check that, few films today are as funny. Enough said. Thanks to those efforts, The Awful Truth, presented in its original aspect ratio of 1.37:1, looks quite good on Blu-ray. An abundance of grain is immediately apparent on this 1080p/AVC MPEG-4 transfer, but such heavy texture was typical of the period and only rarely distracts from the on-screen action. Contrast and clarity are excellent. Blacks are rich, whites are crisp, and nicely varied grays enhance depth and detail. Wonderfully sharp close-ups flatter the stars, and hardly any print imperfections could be detected. Several transitions err on the fuzzy side, but that’s also to be expected considering the material’s age. The LPCM mono track was drawn from a 35mm soundtrack positive that had been created from the nitrate 35mm original soundtrack negative, and the music cues were taken from a new transfer of the original soundtrack negative. The audio is quite clear, so all the snappy dialogue is easy to understand, and the music sounds surprisingly full-bodied. Effects are distinct as well, and any age-related surface noise has been meticulously erased. As usual, Criterion provides a substantive extras package. In addition to a 20-page illustrated booklet featuring an essay by esteemed critic and author Molly Haskell, there’s a terrific video essay that dissects Grant’s performance; a lovely 1978 audio interview with Dunne; a perceptive examination of director Leo McCarey by critic Gary Giddins; and a 1939 Lux Radio Theater adaptation of The Awful Truth with Grant and Claudette Colbert. I Still don’t understand how Bellamy got an Oscar nomination and Grant did not! Bellamy was fine – but better than Grant?! Not even close! I assume that working on this earlier picture together led to the joke in His Girl Friday when Grant describes Bellamy’s character as a man that “looks like that guy in the pictures – Ralph Bellamy”! Yeah Bellamy really plays the exact same character in His Girl Friday, minus the domineering mother. I honestly think Grant didn’t get a nomination because he made the whole thing look so easy! He only got one Oscar nomination in his entire career, which is criminal, but everybody thought he was just playing Cary Grant all the time and how hard is that?